We specialize in videos for English language teaching and in addition to training videos, we make promotional videos for products, organizations and events. Please contact us to see examples of our many e-learning and video productions. 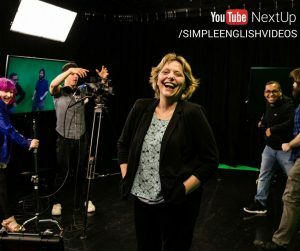 The Simple English Videos studio is equipped with a green-screen set, teleprompter, professional lighting, multiple wireless mike systems, boom shotgun mike, a whisper room and more. Our multimedia development software suite includes Adobe Premiere Pro, After Effects and Captivate as part of the complete Adobe eLearning and Creative Suites. First prize for ESP in the English Speaking Union Book competition (two times winner) Winner of a Cine Golden Eagle in the training film category.Joint first prize winners of the David Riley Award from BESIG, IATEFLWinners of the YouTube NextUP 2016 award for channels showing strong growth potential. Contact us to get a quote for your language training video project.